I just can't believe that we are into February already and that it's over two months since I posted on my Blog. Just before Christmas I made two roomboxes as gifts; one for my cousin who is not a miniaturist but asked for something in a shabby chic country style and one for my daughter who has recently bought her first flat and I based it on her room which we all helped decorate. The basic roombox with a bay window added to provide the window seat. I think I like window seats in my minis because I'd love to have one for real! The mannequin started life as dark wood, I painted it white and decoupaged strips of a lovely pink floral paper. The finished roombox complete with her little dog Pixie. Happily my cousin loved it and here it stands in its new home. 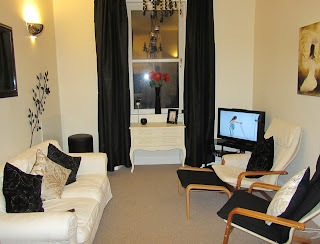 This is the kitchen/ living room in Lynsey's flat and we had great fun decorating it ... I wish I'd had "before" photos to show as it really was stuck in a 70's time warp!! 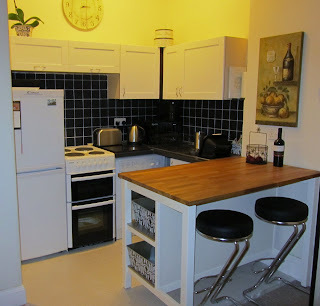 This is my mini version of the kitchen, I love the stools which were from Elf Miniatures. The French baguette is from Christel Jensen and the fabulous cheese platter from Amanda Speakman. Sophie, one of Lynsey's favourite cats when she was wee. That's it for now, on with the tidying and organising before moving on to one of the many revamps that I've got planned. I'm delighted, Jackie! What a wonderful work! The roomboxes are beautiful, all very well done, congrats! Jackie, they´re great! I love your posts as you´ve so many amazing details in your scenes and it´s always fun to make the pictures bigger to find even more "uh"s and "Ah!"s. And I get more and more found of roomboxes...as you can display them so much easier. Thanks for showing! The first room is so cozy and has beautiful colors. The other room is modern and fantastic made, too. Ciao!! Piacere di conoscerti ...il tuo blog mi piace tanto ti aggiungo nei miei preferiti!!! I tuoi lavori sono bellissimi ..sei bravissima!!! I have just found your blog and I am sorry I wasn't aware of it until now, because it is simply amazing! There are details that sometimes make me wonder whether the scene is in real life or in miniature... Well done! I love it!!! Hi! You've got a lieber blog recognise in my blog. If you want, come to get it. Congratulations. What lovely gifts to give, Jackie. You clearly put a lot of time and effort into them and it shows. Beautifull roomboxes, i am sure your cousin was in the seventh heaven with them. Compliments for all your Roomboxes. Your scenes are amazing! Excellent work - I'm glad that I found your blog! This February I, too, finally gave the first three of my roombox - but I love them all so much and sorry to give)))) But I want to build new ones - I need space! Jackie I am in love with your work!!! Your room box is amazing!! I adore all those little tins and all the beautiful colours!!! Thank you. The canisters are plain white metal (bought) and I decorate them using decoupage technique. I sold some a few years ago on Ebay but am hoping to set up an Etsy Shop as I have been busy making lots of little cushions and biscuit tins. As you can see I haven't updated my Blog for some time and must do it soon. j'aime beaucoup le coin fenêtre, très féminin, le salon aussi. I have just discovered your blog (through Pinterst). I've been reading all your posts and love everything! - especially your printed items! I've been much inspired to try making some of my own. I'd like to know where I can get the Supersoft Paper you printed the adorable pink Christmas stocking on(from your post dated Dec 8). I did an internet search and only found Supersoft Inkjet TRANSFER paper. I assumed you printed directly onto the paper you mentioned. Am I wrong? Thank you, I'm so glad you like my printed items. The stocking was printed on Pabric Soft Sew which I buy online from Crafty Computer Paper in the UK, it is good because it doesn't fray but sometimes I think the colours don't come up too well. Please check back over the next couple of days and happy printing! Thanks Jackie for answering my question - glad I "found" you when you were "returning" to your blog! I have a lot to learn about printing minis - every little bit helps! I know absolutely nothing about manipulating/resizing images, but am eager to learn! What software do you like to use?